You are cordially invited to our annual fall party! This year our theme is "60s, 70s and 80s Hippies". 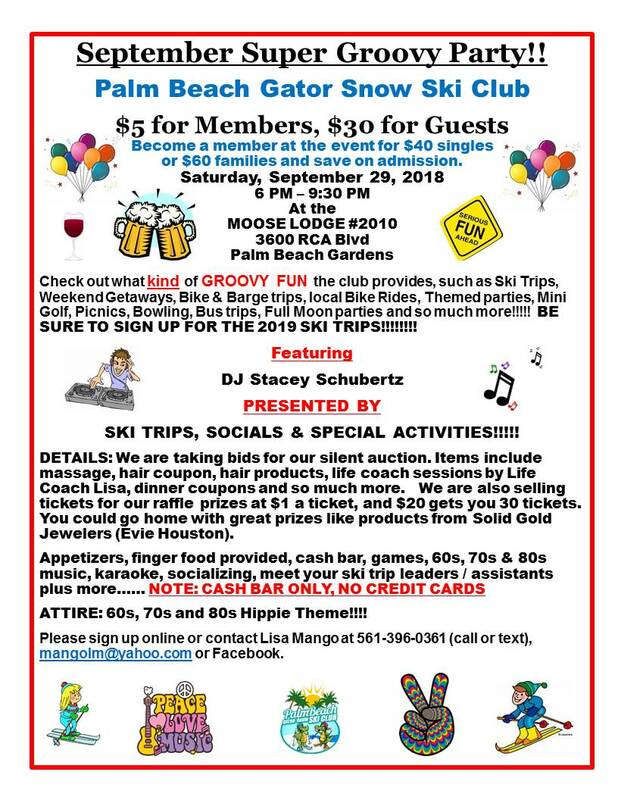 We will have a fabulous DJ for your entertainment - DJ Stacey Schubertz. Dance to the music of the 60s, 70s and 80s, plus we will have karaoke. We will be highlighting all of the events we do: ski trips, socials and special activities. Come party with the Gators and have a marvelous night of dancing and fun. Find out more about the fun activities we have planned for you. Please invite your friends who may be interested in joining our wonderful club. We will provide appetizers and there will be a cash bar (no credit cards). Please RSVP (register) so we can plan accordingly. Do you have products or services our members may be interested in? Support our Club by becoming a Sponsor. Check our our modest ADVERTISING RATES.